By Hawksmoor in brown ink below plan, Water pipers at. A, B, C, D, E, F, G. for Rain Water / Necessarys, and foul Water at H, I, / kitchin Water, at k and L or either of them / a cistern of Water and wast pipe may be at M. / N . O Doors into ye Roofs over ye Wings, where may be Wash places if / Wanted; and along lower left edge of sheet, The south West Pavilion in Queen Anns Court / N. H. June 1729; and with letters and a few dimensions in Hawksmoor's hand; and by John James with numbered scale bar and many figured dimensions in graphite and in pen and brown ink; and by C19 hand at top and bottom right, 48. Pen and brown ink over graphite under-drawing on laid paper, laid down, with central horizontal fold. 500 X 380. The completion of the south pavilion of Queen Anne's Court was ordered in May 1729, after a general audit of the accounts in 1727-28 and the decision by Parliament at the end of this period to grant £10,000 a year for the completion of the hospital (see Bold 2000, p.156). The shell of the building had been constructed but the floors had not been added. The whole interior of the south pavilion had not been designed in detail and the drainage system had not been worked out. This drawing bears James's hand in the scale bar and in many of the dimensional notes (e.g those along the outer elevations, where the feet and inches are separated by dots or dashes). Hawksmoor amended the plan with notes and sketched additions, and with a title and an explanatory list at the upper right and top sides of the sheet in its original sense, when the scale bar was at the bottom. These notes concern the drainage of the building. This is the latest known drawing by Hawksmoor for Greenwich Hospital. It dates shortly after his final master plan of 1728 (Bold 2000, fig. 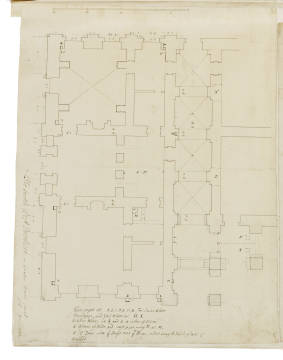 144) and his record drawing of the ground-floor plan of the King Charles II Court, [11/4].